"Excellent DVD's and training system. My pup is learning fast." By: Steven W From Mn. Excellent DVD's and training system. My pup is learning fast. "Very simple method and easy to follow." Very simple method and easy to follow. "If your training pointers, I highly recommend this set!" Price seemed high to me, but once I watched. I understood the saying you get what you pay for. These are Great DVDs. Keeps things simple, and doesn't leave any questions. If your training pointers, I highly recommend this set! "Well done and very interesting approach." Next pup will be a setter, so looking at this method. Well done and very interesting approach. Great video and instruction. Good, and easy to understand format. Straight forward and simple! Easy to follow and implement. Great videos! Big help getting puppy started in training. Also easy for kids to watch and learn basics of training. Highly recommend! Great foundation DVD set. 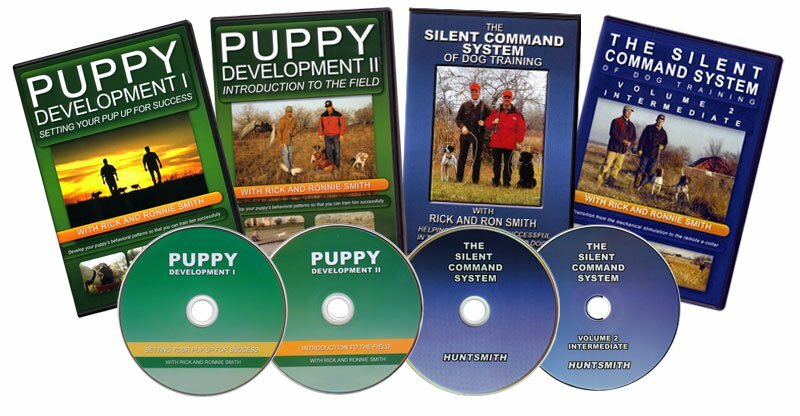 Will definitely put you on the right track to get the best out of a pointing dog. The Smith's have a great approach but it is not a complete training video. A bit scattered on the timeline for the pup. Need to couple the video up with a book like Delmar Smith's to get a chronologic order of progression. Includes both Puppy Development and Silent Command DVDs -- 4 discs in all! The introduction to the Silent Command System covers proper use of the Stakeout Chain, Command Lead, Check Cord, Whoa Post, Reading Scent and Working Birds. This video continues from where the Silent Command System Foundation DVD leaves off. Rick shows you how to use the point of contact on the neck as a remote command with the e-collar. Transition from a command lead to the e-collar smoothly with the foundation training your dog already has. The goal is for your dog to hunt for you, not you hunt for your dog. Ronnie covers the flank point of contact and shows how to properly place and use the e-collar on your dog. From a simple whoa command to backing another dog on point in the field, the purpose is to have a dog that is under control and accepting commands. By using the Silent Command System, your dog will learn more easily because he doesn't have to learn our language. This eliminates the frustration that can result when dogs are pushed too fast and too hard. 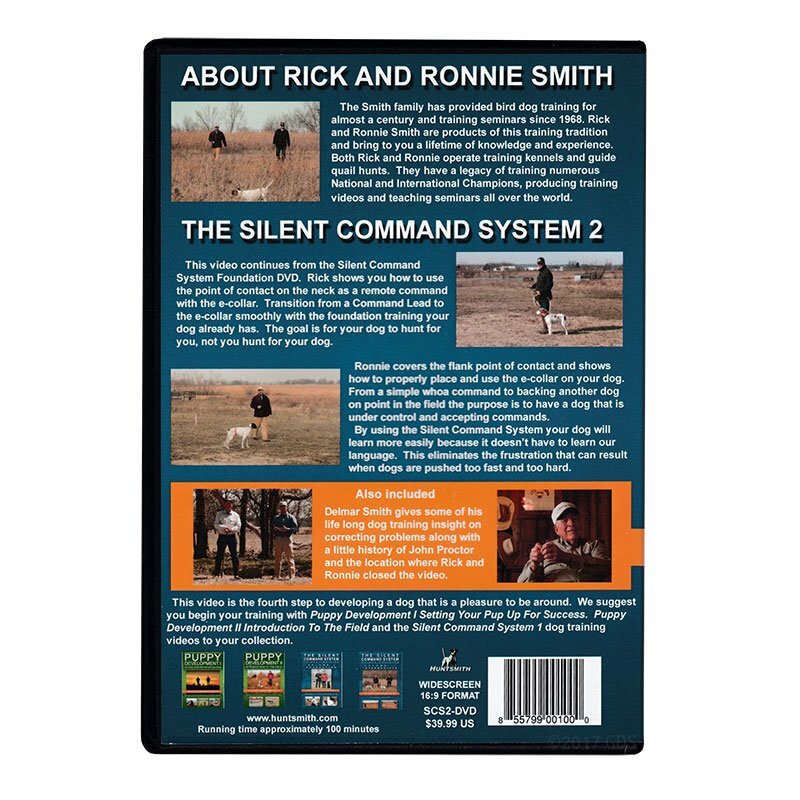 The Silent Command System Volume 2 also includes Delmar Smith giving some of his lifelong dog training insight on correcting problems, along with a little history of John Proctor and the location where Rick and Ronnie closed this video.